How much does a Asbestos Removal cost? The average cost for a asbestos removal is £1600. You are likely to spend between £800 and £3000 total. Exact price may vary depending on your area and project details. Do you know if your home contains asbestos materials that can cause serious health problems? 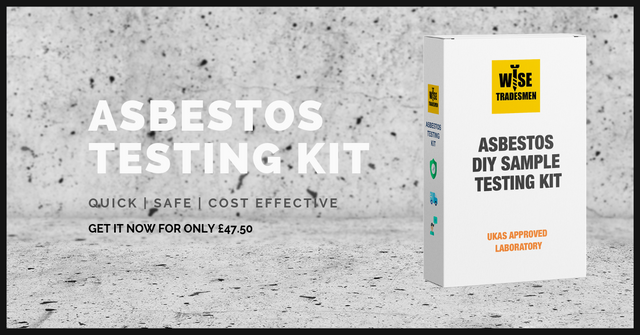 Use our guide to find out how much it might cost to carry out an asbestos survey and asbestos removal work. Asbestos is a naturally occurring mineral that was used in many building products from 1930 onward until the danger of it was discovered. Breathing in the small particles can cause lung cancer called mesothelioma, that is fatal, and other respiratory illnesses. The illnesses take years to develop after the first inhalation of particles. When the dangers were discovered the use of asbestos was banned and it has not been used in building materials since 1999. However many houses built before this can contain asbestos. The problem with removing asbestos is the fine fibres that it sends into the air. The cost for asbestos removal will depend on the location and the extent of deterioration. Asbestos is harmless if it has not deteriorated but as it is disturbed the fibers are released into the air. You should hire an asbestos surveyor to see if you have any asbestos materials in your home if it was built before 2000. An Asbestos Management Survey is required to be carried out yearly on non-domestic properties and private householders can also have a survey carried out to determine if their property contains materials with asbestos. A large area such as a garage can cost up to £2500 to remove all asbestos materials. Find out more about asbestos survey costs. Always use qualified professionals and get quotes before the removal commences. Average cost per asbestos removal work can cost from £800 to around £3,000 for bigger jobs such as removing asbestos pipes and lagging in a loft. The Control of Asbestos Regulation states that there are no more than 0.1 fibres of asbestos per milliliter of air measured over a 4 hour period. A qualified air testing surveyor will carry out this test before and after removal of asbestos materials. The price of air tests depends on the air test carried out and how many air tests are needed. Always ask for a quote before any testing is carried out. Find out more about asbestos air testing costs. Many garage and house roofs made between 1930 and 1990 contained asbestos. The cement roof sheeting is common and if it is in good condition it is not a problem. If it starts to break down and release fibres into the air or you need to demolish the garage for some reason it will need to be done in accordance with the regulations. You will need to hire a professional asbestos removal company. Find out more about asbestos garage roof removal cost. Many of the local councils will charge you a small fee to remove any asbestos containing materials and some councils provide this as a free service. The cost of removing domestic asbestos is often undertaken by your local council. Make sure that you ask to see their accreditation and licenses before they start. Get FREE no obligation Asbestos quotes and see costs in your area now!